Stanford bioengineer David Camarillo knows all too well that bicycling is the leading cause of sports- and activity-related concussion and brain injury in the United States. He's had two concussions as the result of bicycling accidents. While he doesn't doubt that wearing a helmet is better than no helmet at all, Camarillo thinks that traditional helmets don't protect riders as well as they could. "Foam bike helmets can and have been proven to reduce the likelihood of skull fracture and other, more severe brain injury," said Camarillo, an assistant professor of bioengineering at Stanford. "But, I think many falsely believe that a bike helmet is there to protect against a concussion. That's not true." The helmet Camarillo tested comes in a soft pocket worn around the neck. It pops up, like an air bag, around a person's head when it senses a potential collision. It was originally designed to address the fact that people don't like to wear helmets for aesthetic reasons. The researchers compared this air bag helmet directly to traditional foam bike helmets. Their results were striking. 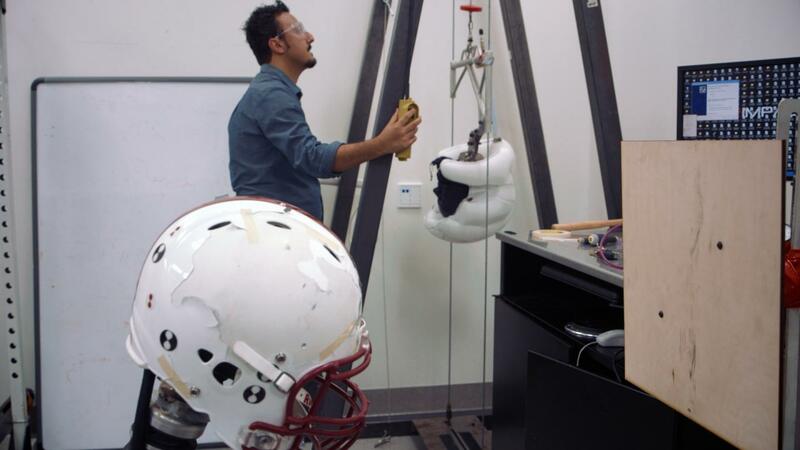 "We conducted drop tests, which are typical federal tests to assess bicycle helmets, and we found that air bag helmets, with the right initial pressure, can reduce head accelerations five to six times compared to a traditional bicycle helmet," said Mehmet Kurt, a postdoctoral scholar in the Camarillo Lab. "As our paper suggests, although air bag helmets have the potential to reduce the acceleration levels that you experience during a bicycle accident, it also suggests that the initial pressure that your air bag helmet has is very critical in reducing these acceleration levels," Kurt said. Without the maximum amount of air, the air bag helmet could bottom out, causing the head to hit the ground with much more force than if it were wearing a traditional foam helmet. In current versions of the air bag helmet, a chemical process triggers expansion, which doesn't seem to guarantee maximum air pressure. "There are many theories as to why concussion happens, but the predominant one is that, as your head rotates very quickly, the soft tissue within your brain contorts and, essentially, what you get is a stretching of the axons, which are the wiring of the brain," Camarillo said. The air bag helmet is not available in the United States but is sold in some European countries. It's a relatively new innovation and, by comparison, helmet standards and testing are very far behind. "If our research and that of others begins to provide more and more evidence that this air bag approach might be significantly more effective, there will be some major challenges in the U.S. to legally have a device available to the public," Camarillo said. Even for conventional foam helmets, the standard testing doesn't address some elements that science indicates matter when it comes to brain injury and head trauma, including assessment of rotational forces and drop tests of parts of the helmet other than the crown. The air bag helmet would raise additional testing issues, including the fact that helmets are generally tested on a head dummy without a neck, which couldn't wear the air bag helmet. It's also their intention to work at making this helmet smarter. It already expands when it senses a likely impact but they want it to be able to predict the severity of the impact and compensate accordingly. Additional authors of this paper are Calvin Kuo and Kaveh Laksari of Stanford University and Gerald A. Grant of Stanford's School of Medicine. Camarillo is also a member of Stanford Bio-X, the Child Health Research Institute and the Stanford Neurosciences Institute.